I love today’s reading (Romans 3). Today’s reading really lays out a great picture of what God has done for us through the work of Christ on the cross. Paul writes … “We have already made the charge that Jews and Gentiles alike are all under sin.” Did you get that? Everyone is under sin. Everyone has sin in their lives. We know that we have sin because “Therefore no one will be declared righteous in his sight by observing the law; rather, through the law we become conscious of sin.” The law shows us that we are sinners. The law shows us where we slip up, where we miss the mark. But the law does not save us. The law does not bring us into an eternal relationship with God. No, that work was done elsewhere. Friends, it is our faith that saves us. It is our faith in Christ as Messiah, as King, as Master that allows God to justify us. So what does it mean to be justified? Well I like to explain it this way … to be justified means at the time of our confession, at the time of our repentance, at the time of our acceptance of Christ, at the time of our baptism into Christ we receive the gift of the Holy Spirit, the forgiveness of our sins, and ultimately justification. That means when we are justified God views us as 100% righteous. When he looks at us it means he sees no sin, just the blood of Christ covering that sin. Jesus has entered into the picture and spoken for our sin. I have included a chart I like to use. On this chart there are two lines. The dot marks our baptism into Christ where salvation takes place. From here one line goes strait up. That is justification. When God sees a person who is justified, he sees a person who is considered a 100% righteous. However there is still a process to work out. In the lives we live we never become a 100% righteous. We still slip up; we still have our moments of weakness. However, our goal should be to continually improve. We may still fall into a valley from time to time, but when we look at our lives from year to year hopefully we see a continual improvement. 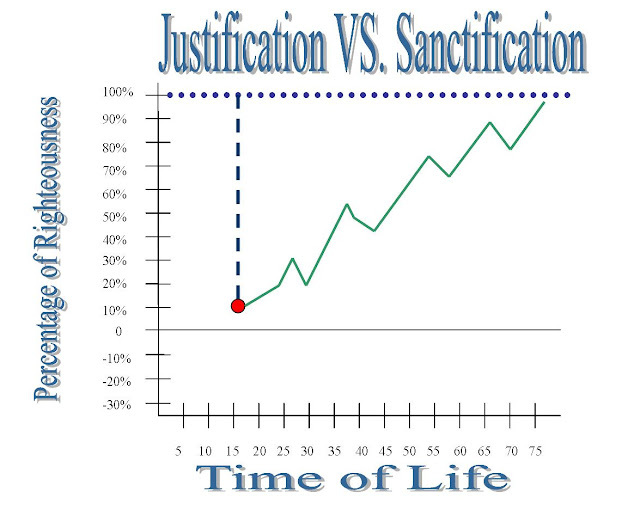 This is the process of sanctification. This is the refining we go through as we strive to be more righteous each day. But the beauty of it all is in the eyes of God we have still been declared Justified! If you have any questions about the chart please leave a comment in the section below with your email and I will do my best to answer them. The image of Jesus was borrowed from the site Annabanan's Blog.